JOCK-DOCS: World-Class Athletes Wearing White Coats by Ray E. Aquitania, M.D. by Ray E. Aquitania, M.D. From successful Olympian to dedicated doctor: eight fascinating, true stories. > > > > > > > > Imagine going through years of athletic training to become an Olympian. The unending hours of strenuous physical activity, the money spent on sports equipment and apparel and travel to international competitions, and the frequent pressure to perform against other hardworking and gifted athletes. Then picture yourself spending years of academic training to become a doctor or acupuncturist. The endless hours of study in classrooms and libraries, the costs of school tuition and books and medical equipment, and the later responsibility of having people's health and sometimes lives in your hands. Each of the aforementioned endeavors calls for self-motivation, diligence, and many sacrifices, making for a very admirable life story. But what of the person who has successfully tackled BOTH of the above challenges? He or she is remarkable indeed. It is the rare Olympian who has gone on to pursue a career in the medical or acupuncture field. And Ray Aquitania has been able to connect with eight such overachievers, each of whom is featured in this revealing book of contemporary biographies. There is the spectacular speed skater Eric Heiden, softball's effervescent Dot Richardson, diving great Sammy Lee, kayaking champion Hugh Fisher, the athletic Debi Thomas in figure skating, the versatile high jumper Amy Acuff, two-time Olympian Juan Felix in rowing, and table tennis prodigy Michael Lardon. What drives a superbly-trained world-class sportsman or sportswoman to later enter the rigorous medical school curriculum? Can athletic success predict later academic triumphs? Are certain sports more likely than others to lead to a later career in medicine or acupuncture? 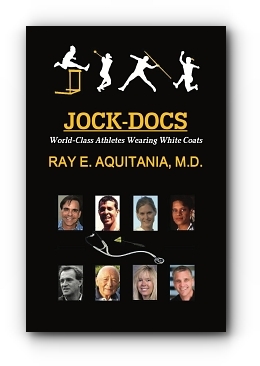 In his book JOCK-DOCS: World-Class Athletes Wearing White Coats, Dr. Ray Aquitania answers these questions and more. Although he is a man of diverse pursuits and accomplishments, the author has always had a special interest in the world of sports and in the practice of medicine. And being an athlete and physician himself, he appreciates the challenges in both human endeavors. Drawing upon his detailed interviews with each jock-doc (or athlete-doctor) and hours of research regarding different aspects of their lives, Ray Aquitania, M.D., chronicles the athletic and academic exploits of eight extraordinary individuals. The reader of this book is given an inside look at their personalities, Olympic experiences, difficult journeys in the academic world, and unforgettable achievements. Ray E. Aquitania, M.D., strives to be the modern Renaissance man. He is a versatile neurologist, Phi Beta Kappa member, agile athlete, world explorer, and now first-time author. He even has a bachelor's degree in chemical engineering. His two great passions? Sports and the art of medicine.